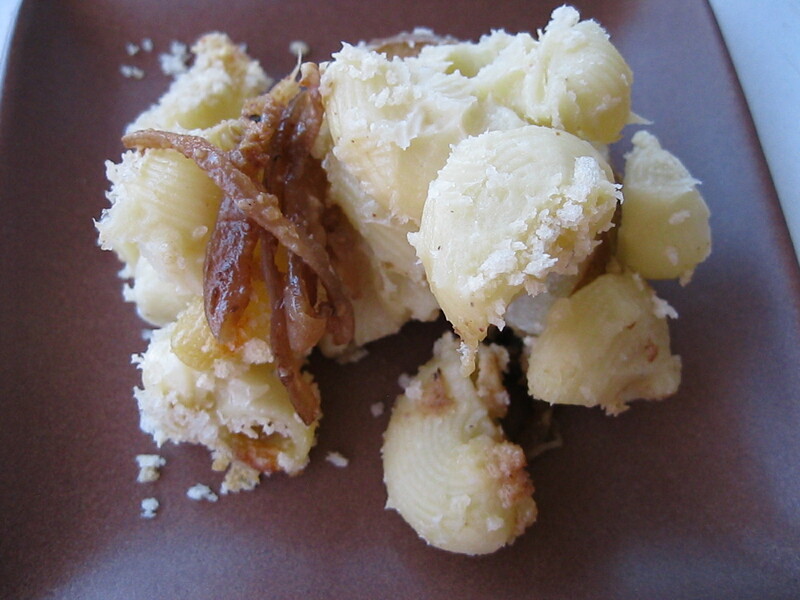 I was inspired to develop a creative mac & cheese recipe because the local cookbook store, Omnivore Books (how lucky am I, by the way, to be living in a place where there are such things! ), was hosting a mac & cheese contest this past weekend. I wanted to take the recipe in a different direction, and I started my brainstorm by shifting the type of cheese from classic cheddar to blue. I also wanted to add some additional ingredients, and I immediately thought of pears. From there, I needed to round out the flavors by adding caramelized red onions. The combination was headed in the right direction, but was still too sweet. I decided to deglaze the pan with balsamic vinegar to help balance it out. Heat olive oil in a medium-sized frying pan over medium-low heat. Add onions. Cook, stirring frequently, until the onions have caramelized, about 10 minutes. Deglaze pan with balsamic vinegar, cook for 5 minutes, and then remove from heat. Cook macaroni according to the directions on the box, reducing cooking time by 1 minute. Drain and set aside. Grate gruyère and cheddar cheeses. Break apart blue cheese into small chunks. Melt butter of medium heat in a medium-sized saucepan. Add milk when the butter-flour mixture is slightly browned and has taken on a toasty smell. Add macaroni to the cheese sauce and stir until evenly coated. Layer onions on the bottom of the dish. Top onions with a layer of sliced pears. Pour pasta over the pears. Sprinkle the top of the casserole with panko so that it is evenly coated. Bake in the oven until the bread crumbs are browned, about 30 minutes. Yum! I want a taste!